Special form tools are nothing new for General Cutting Tools. Whether it is made from high speed steel or carbide tipped, we can accommodate shaper form knives, shaper cutters, William & Hussey knives, Molder heads, corrugated back knives and many others. Our 7-axis CNC tool cutter grinders and master tool makers have the knowledge and equipment to make you that special tool. Send a drawing, bring a tool or sample piece of the wood and we can make a tool to perfectly match. This is perfect for those who are doing a restoration project and the cabinets or molding is no longer available. If you have a job where a standard bit is not available, we make custom tooling also. Simply provide a sample and we can make the exact cutter to make that shape. 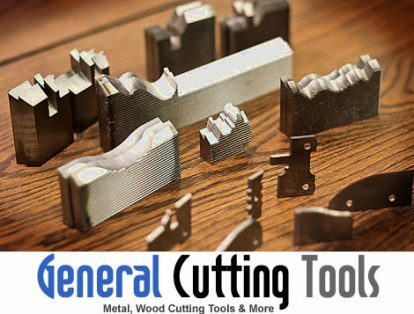 We have a large assortment of collets, holders and accessories for all your woodworking equipment.